Plaid, like pinstripes, is an old standby for fall--every other year or so, it tends to get a big push from the fashion magazines. This is one of those years. However, I think plaid is important this season because of the whole Grunge revival, led by Marc Jacobs. So far I'm not so sure that it's taking off (it will be interesting to see what happens when the temperature really dips), but as I've said before, I enjoyed Grunge the first time around and I'm more than happy to dabble in it this time. With a more elegant take on the trend, of course. If you're going Grunge, why not go straight to the master? This Marc Jacobs sarong skirt evokes the iconic flannel-shirt-around-the-waist look, but with a slightly more flattering fit. Well, and it's wool, not flannel. Tartan plaids are also popular this season, and it's always fun to kill two birds with one stone: This plaid jacket from DSquared2 also has a slight trapeze shape. It's also one of the most refined things I've ever seen from the Caten brothers, so good for them. The soft, faded plaid and crinkled texture give this Chloe minidress a grungy look, but I saw this shape of dress all over the tents in Bryant Park. Chloe doesn't seem to be in a huge rush to replace Phoebe Philo, but as long as the design team keeps turning out awesome dresses like this, who cares? 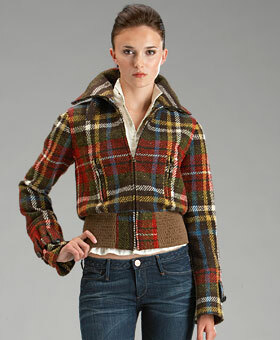 Earnest Sewn now makes non-denim items, like this cute plaid jacket. 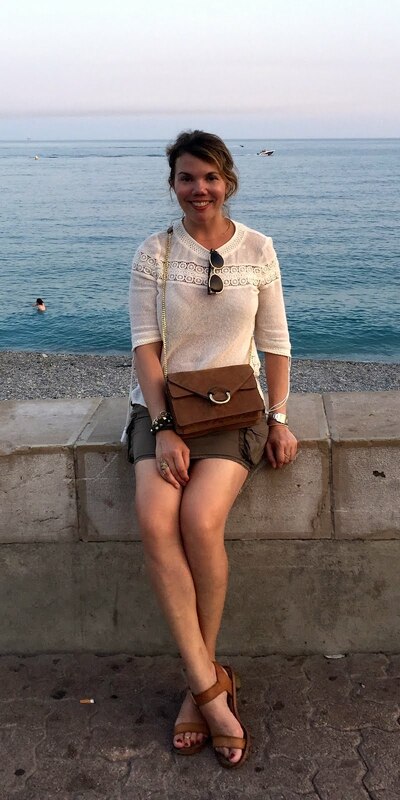 It kind of has that British foxhunting look about it, and I like the cropped fit too. 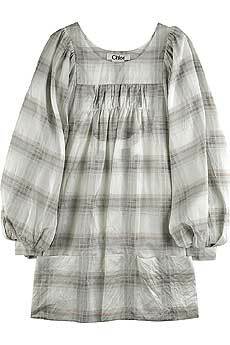 This plaid shirt is really cute--a fitted, French take on the plaid shirt. A.P.C. 's clothes are tailored very well, so you can be assured this isn't going to gape in the bust or do other weird things. Please go to A.P.C. 's website to look at it though, because for some reason I can't see the bigger version. It takes a brave soul to wear plaid pants, and it takes a freakin' fearless warrior to wear plaid skinny pants. So if you've got the gams, please wear this awesome pair from Alice & Olivia. Accordingly, they're availble only in size 8 and below. Another example of killing two birds with one stone, this plaid jumper from Delia's is, well, both plaid and a jumper. I love the mod look, and it's a durable wool blend, which is a nice little surprise. 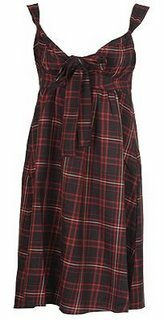 Forever 21 has all manner of cute plaid things, but this dress stands out because it's not a jumper, a jacket, a kilt, or a shirt--i.e. other traditionally plaid items of clothing. I like the babydoll shape, and it would be supercute with a black tee underneath. Sometimes all you need is a good accessory to convey the trend. This wide headband from Urban Outfitters does the trick for a mere $16. True, it's more Greenwich than Grunge, but not all plaid needs to look like it came from Salvation Army.